На основе M.2 Hawk спроектирован одноместный гоночный самолет M.5 Sparrowhawk, позже этот M.5 использовали как экспериментальную машину под обозначением U-3. 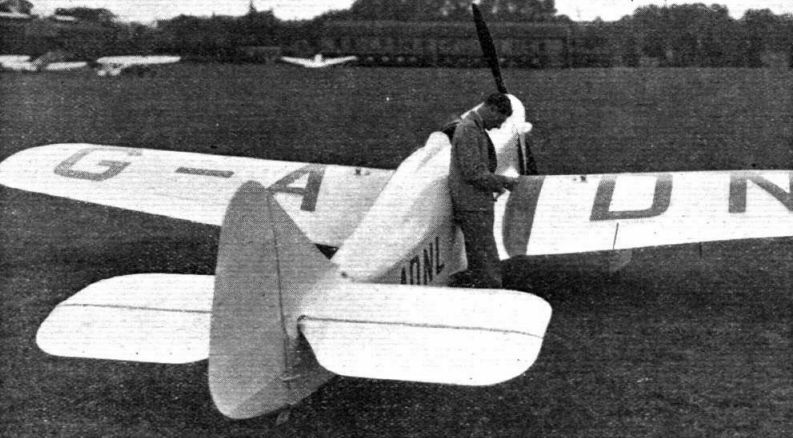 IN the King's Cup Race this year an attractive little sports monoplane, then known only by the Phillips and Powis works number M.5, was flown by its designer, Mr. F. G. Miles. Since that time the company has decided to put this type on the market as a fast sporting machine for the private owner and as a military trainer. One of the most attractive of its abundant qualities is the low landing speed of 42 m.p.h. which it possesses in spite of its maximum speed of 180 m.p.h. with a high-compression Gipsy Major engine. In general appearance the machine somewhat resembles the Hawk Major, but it is a rather smaller type with a span of only 28ft., whereas the Hawk Major's span is 33ft. The height also is considerably less. Structurally it is a typical Miles product, wood being used throughout, the covering of fuselage and wings being plywood. In the Sparrow Hawk the centre section extends only for the width of the fuselage and the undercarriage legs are attached to the wing somewhat further outboard than in previous designs. 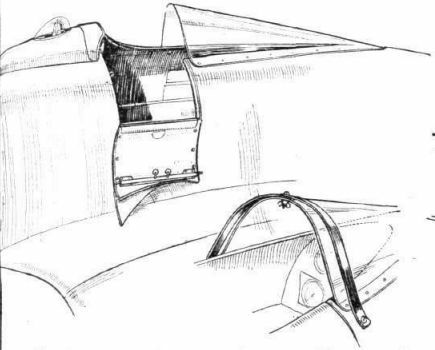 The machine may be used either us a single-seater or a two-seater, the front cockpit being covered over in the former case. 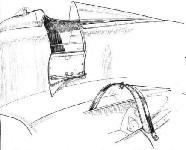 Miles split trailing-edge flaps are included as standard equipment. The price is L825. Maximum speed at 1,000ft 180 m.p.h. Cruising speed at 1,000ft 155-160 m.p.h. Range (22 gallons) 415 miles. Fuel consumption at cruising speed 8 1/2 gall/hr. N.B. - The above figures are for the machine with the front cockpit covered in. With the standard Gipsy Major the maximum and cruising speeds are reduced by 5 or 6 m.p.h. but the range is increased to 540 miles. Speed and comfort. The Miles Sparrow-Hawk does 175 m.p.h. SPARROWHAWK Gipsy Major Engine. A super Sports Model - Price ?870 ex Works. WON PRIZE IN KING'S CUP RACE FOR FASTEST TIME OF DAY IN ITS CLASS. Maximum Speed 175 m p.h. Cruising Speed 150-155 m.p.h. 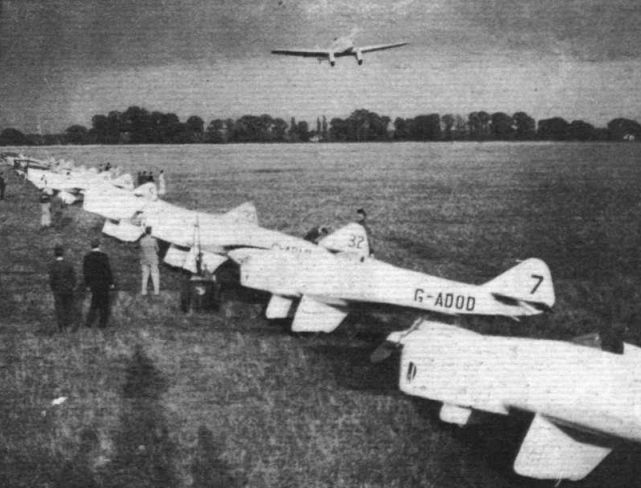 Landing Speed 42 m.p.h. If fitted with High Compression Engine, Top and Cruising Speeds raised 5 m.p.h. Petrol consumption 6 1/2 galls./hr. Range 504 miles. The prototype Sparrow Hawk in the hands of Fit. Lt. "Tommy" Rose. Real racing: The scratch man, W. Humble (Hawk Six), truly vertical as he rounds the grandstand turn at Hereford. He averaged 184 m.p.h. over the ninety-mile course. 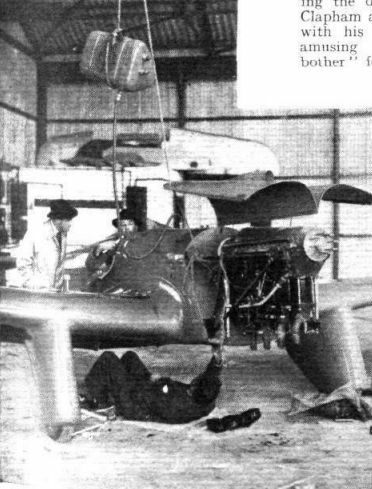 A view of the Hawk M.5, of which F. G. Miles is both designer and pilot. 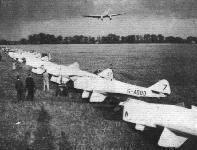 The Miles "Hawk M.5," which, entered by Mr. G. A. Hebden, will be flown by Mr. F. G. Miles. 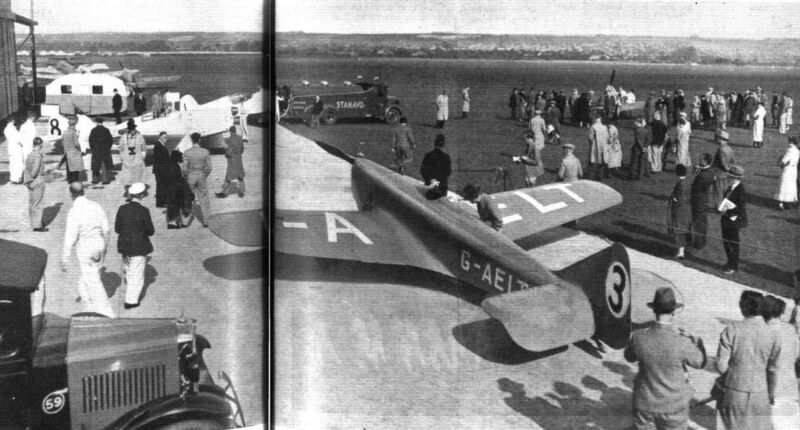 This machine is a standard two-seater, but has a reduced wing area, faired-in front cockpit and high-compression "Gipsy Six" engine. M.5 Sparrowhawk отличался элегантным обликом. 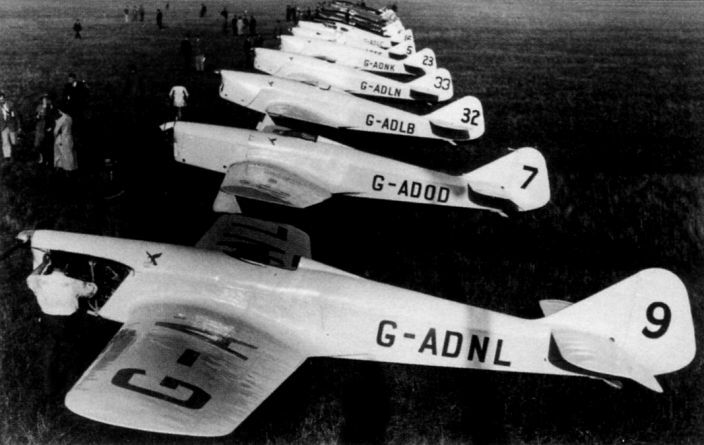 Прототип G-ADNL получил приз за скорость в гонках на Королевский кубок 1935 года. PREPAREDNESS REWARDED: All the eleven Miles Hawks and the two Miles Falcons lined up for inspection by a large number of guests on the day before the King's Cup entries were due at Hatfield for presentation before the scrutineers. The firm will probably go down in history as the first to be completely ready for the race, and their preparedness was certainly rewarded with four machines in the first five of the final. It was extraordinary that all the machines could have been brought for the presentation as many of them had already been delivered. During the afternoon Mr. Miles demonstrated the manoeuvrability of the New Hawk M.5. 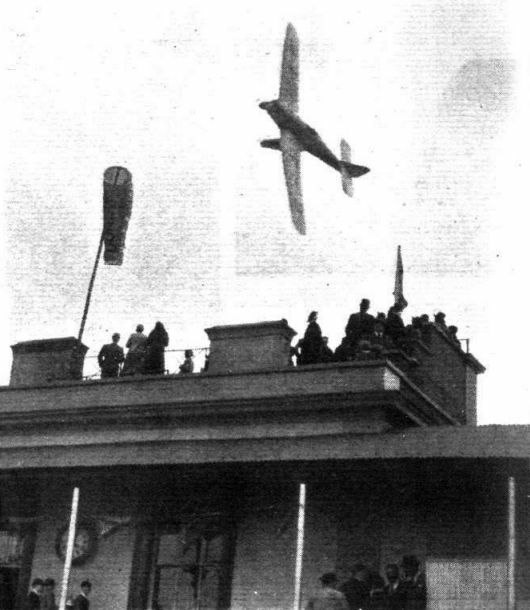 with a display of superbly executed aerobatics. Homage to E. F. Walter's Hawk and F/O A. E. Clouston's Sparrow Hawk (scratch) at the start of the Contact race. Monday's preparations - a pleasant scene at Portsmouth airport. In the foreground is Victor Smith's Sparrow Hawk. F/O. A. E Clouston clears up a matter of regulations before the start with the support of his Miles Sparrow Hawk, which incidentally, put up fastest time. Night shift: Lt. Cdr. C. N. Colson, works manager of Phillips and Powis, submerging into the depths of Victor Smith's Sparrow Hawk for an inspection of the repairs made during Saturday night to the tank, a head of six feet of petrol is being used as a test. Detachable aluminium rain deflectors on Mr. Victor Smith's Sparrow Hawk.